I came across this recipe on a Swedish blog while googling Jansson’s Temptation. It immediately caught my attention because one of my favourite breakfast fry-ups used to be diced bacon, apple and onions, with a fried or poached egg on the side. I haven’t made that for ages, and here was the same tasty combination as a quick and filling supper dish. I had to try it and the results were excellent. A new default dinner! I have tweaked the proportions a bit from the original because I found it a bit floury (though cooking it for a bit longer might have solved that problem). 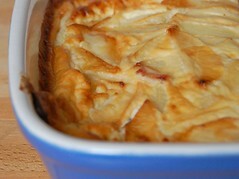 Though Swedish, it’s recognisable as a savoury clafouti. This makes four very generous servings; we had it with smoked chilli jelly on the side, which was delicious. A salad or simply steamed green vegetable would be good too. Preheat the oven to 200C. Sprinkle the bacon over the bottom of a large gratin dish and put in the oven for 5 minutes. In the meantime, finely slice the onion, and peel, core and slice the apples. Add these to the dish and return to the oven for another 5 minutes, while you make the batter; simply beat together milk, flour, and salt, and then beat in the eggs. Pour into the dish and bake for 25-30 minutes until nicely browned. Hi and thanks for your comment on Cuisine Quotidienne. I think maybe I have seen your blog once or twice, but didn’t realize you were living in France. I will definitely add you to my sidebar – there aren’t that many French food blogs written from France in English,a ctually. Thanks! You’re now on my blogroll and I’ll be checking your site regularly.